If you really want a challenge involving long building processes and high piece amounts, then enjoy this instructable. If you have any questions regarding step clarity, let me know and I answer you(almost immediately). For now, this will be my only instructable. Enjoy! Please rate! I've also took the pictures with a canon HD video camera so the pictures came out crystal clear, clear enough to be manageable as a pdf instructable. The pictures are over 2000x3000 in size and are over 950 Mb's worth of uploading. Below is a video showing how to play it and also some of the bugs this design still has in it. This may take you a while. Also, micro knex black gears and chain links will be used. This step is the first longest step in the project. The dollar bills refer to the position of the area of the part. Look carefully at each picture. The second longest step. Take your time and carefully attach step 2 to 1 which is difficult. Now let's build the legs. I would recommend thinner string for smoother movement. You will be working under the model so be careful. This step is a little tricky. Look at the pictures very carefully. My favorite part in the whole model. Follow the pictures carefully. Another piece consuming step but the last of them. Very important pieces! Attaching these walls may be a little tricky so try not to push too hard when snapping them onto the play area. 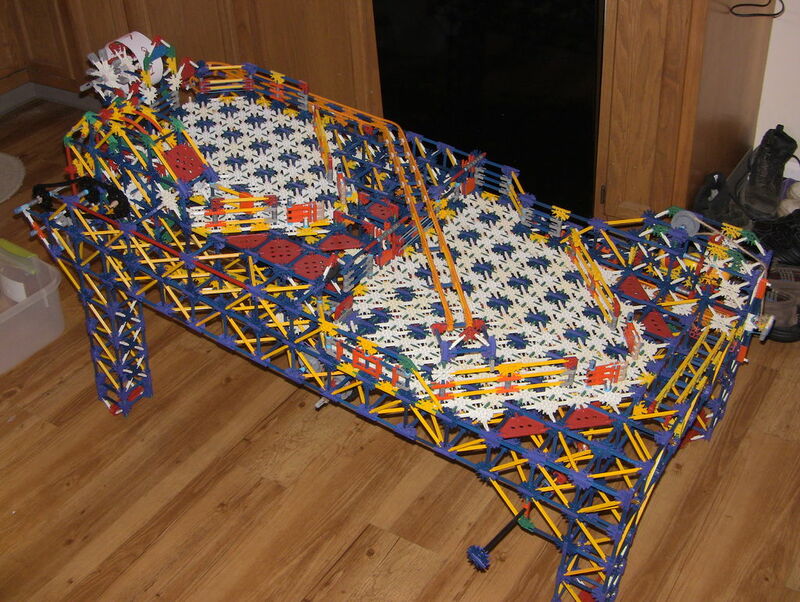 You don't want to damage the play areas because it is very difficult to get under it to repair it. A complicated step. Look at the pictures carefully. The cool bit that keeps score which works like a ratchet. You will also need scissors, a sharpie, strip of paper, and scotch tape. The almost impossible to hit ramp. You are done! Just a few more tips on how to play. Scoring is done when the ball reaches the score chute and a point will be awarded. The ball will shoot back down to the bottom play area and the process is repeated seven more times until you reach 8. The red connectors mentioned earlier in the motor section controls the reset sequence of the drop gate. This is normal mode. Remove them for easy mode which will disable the drop gate from blocking the lift passage. If the drop gate doesn't fully lock when reset, adjust the string attaching it to the motor section. Same situation goes for the ball release system. Have fun! How long is the string on step 5? It's been years since I built the machine but my best guess would be around 5 feet long. Hope this helps! I only have around 950 blue rods and 420 purple connectors, is there any easy way I can decrease the number of those pieces required? The weight of the ball hits a switch to rotate the wheel just far enough for the ratchet to catch it on the second digit. I's a simple ratchet mechanism but it works. Also, is there a way to add more numbers? Haha! 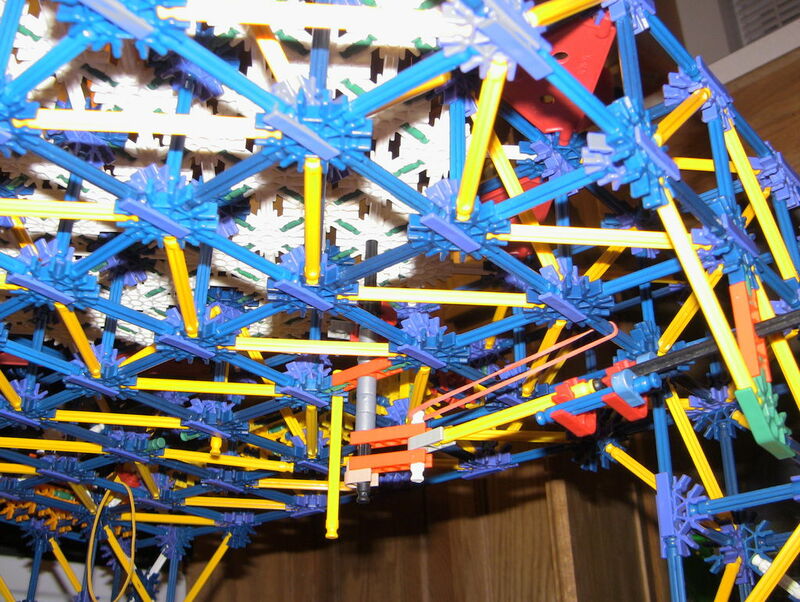 Knex Double- Decker- What- The- Hecker Pinball Machine Instructions!